Foodex Saudi 6th Edition is set to take place at the Jeddah Center for Forums and Events from 12 to 15 November 2018 with the previous exhibition securing around 600 international brands. Every year, the event welcomes companies from more than 32 countries in a bid to attract influential Saudi food importers, distributors, and investors. The exhibition was inaugurated by Prince Abdullah Bin Saud, chairman of the Tourism and Entertainment Committee at the Jeddah Chamber for Commerce. 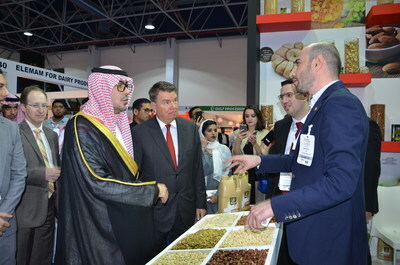 Prince Abdullah said that the wide participation of European, Asian, and Arab countries proves the event’s importance and high demand for diversity in the local food market. According to recent statistics, the Kingdom imports about 70% of its food and spends about SR 87 billion annually (CDSI). Al-Sunaidi mentioned “Salon Culinaire” competition with participation of 158 chefs from different countries in 16 professional sections, representing the most famous restaurants and hotels in the Kingdom and supervised by World Association of Chefs Societies (WACS), Saudi Arabian Chefs Table Circle (SACTC), as well as Saudi Arabian Chef Association (SARCA). The Foodex exhibitors and guests from the previous event are pleased by the results and are looking forward to come back this year. “We think that the visitors are professional. They are looking for specific products. I’m quite satisfied with Foodex Saudi,” said Tomas Llistosella, Export Manager at Frit Ravich, Spain. “This is the first time we’ve decided to come to Saudi Arabia. It’s a very nice show. We had the opportunity to meet a lot of potential buyers, and probably we are going to come back next year,” said Luiz Eduardo Yurgel, International Trade Director at Josapar, Brazil. “This is our first time in Foodex Saudi. We are delighted with our participation, as we had a chance to meet a lot of trade professionals, businessmen and investors,” said Hussen Alfakih, General Manager at AL BARAKA FRESH DAIRY FACTORY, UAE. “We found the exhibition very good in terms of organization and in terms of high-quality visitors. We made good connections and had useful negotiations. I think that after the exhibition we will be able to maintain good business relations. Most likely, we will participate next year as well,” said Enver Saidoglu, Export Manager at IMPA ICECE KVE MESRUPAT PAZ. SAN. TIC. LTD. STI, Turkey. “It was a very well organized and eventful show with high interest from the visitors. I am sure that expectations were met. The international pavilions were set up nicely and the exhibitors from the whole world were well selected,” said Chef Thomas Gugler, President of World Association Of Chef Societies (WACS). Saudi Arabia has the largest food market in the Gulf and the Middle East, boasting with strong economic and consumer power, according to the recent data from Central Department of Statistics. Fast food market exceeds SR5 billion a year with the retail sales growing by 66% fuelled by a large number of new hypermarkets and food markets. Food and beverage imports are expected to increase up to SR130 billion riyals by 2020, comparing to current 80 billion riyals.